At Heirloom Wooden Toys, they believe that children thrive when they play with simple, earth-friendly toys that inspire the imagination and spark long sessions of creative play. Natural toys are great for kids and for the environment. Providing natural toys to your kids is just one way you can help limit their exposure to toxic chemicals and let them develop their own sense of play at the same time. 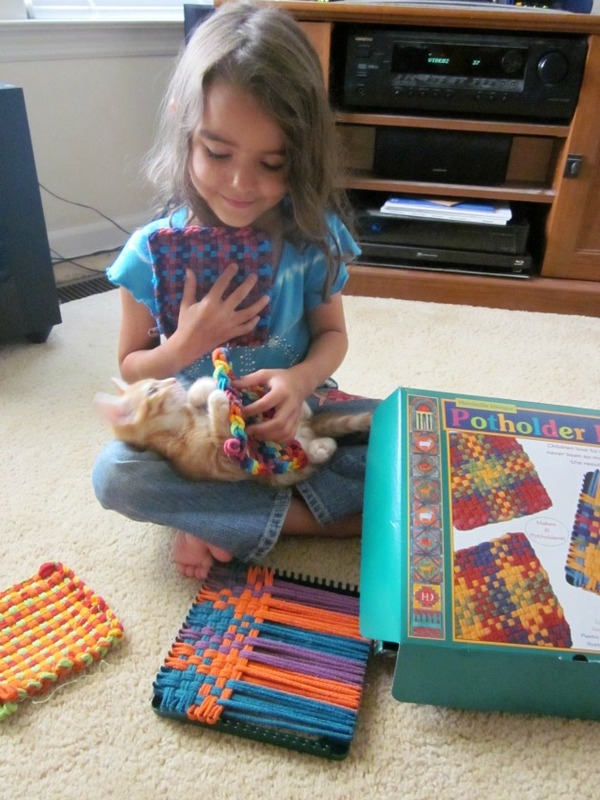 I chose to review their Cotton Loops Potholder Loom Kit. Pretty amazing selection, right?! Of course, that made choosing an item to review quite difficult with so many great natural toy choices but I did end up choosing the Cotton Loops Potholder Loom Kit, which they call Potholder Loom Deluxe. When I saw the Potholder Loom Deluxe, it brought me straight back to my own childhood and I remember how much I loved making the potholders and how proud I felt of my creations. I chose to get one for my daughter and I am very pleased to say that she loves it just as much as I did. Creating something useful is such a marvelous feeling especially for a child who doesn’t get to do that as often as adults can. My daughter is 6 and she absolutely loves it. I showed her how to do the first one and then I did the edges for her while she watched. She did the second one 100% by herself and I couldn’t be more proud! My 4 year old son can start the process but the weaving part is a little too tedious to hold his interest but he loves to watch my daughter do it. I honestly believe every child should get one of these looms because they are so fun, great for increasing hand eye coordination, planning skills, and they give such a sense of accomplishment. 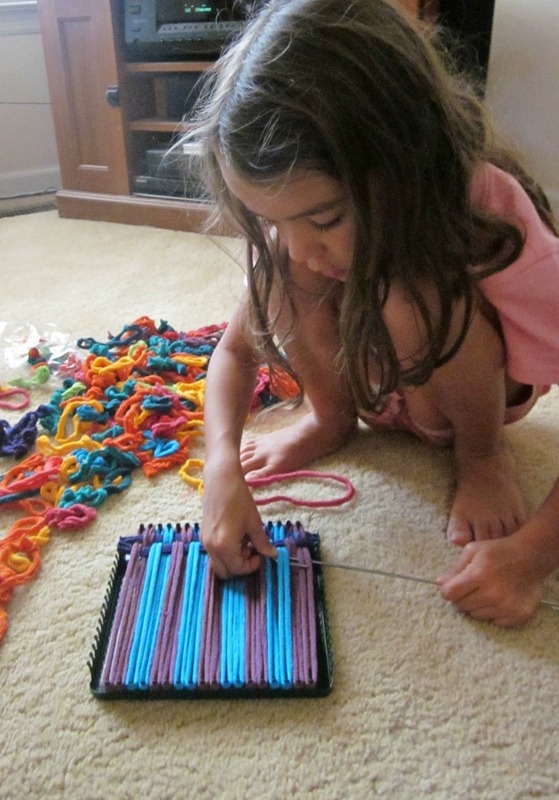 My kids and I love the Potholder Loom Deluxe! My daughter just finished her 5th potholder and she uses some of them as doll (or kitten) blankets and we plan to have her give a few of her creations away for as DIY Christmas gifts to relatives. It really is lots of fun and keeps her entertained for long periods of time. One thing I would like to mention about this potholder loom kit is that is really is deluxe in the sense that it has a nice sturdy metal frame and hook (as opposed to cheap plastic) and it has real cotton potholder loops. So many potholder loom kits have synthetic material loops these days and it is nice to see the cotton potholder loops both because they are a nice texture but also because then the creations can safely function as real potholders instead of melting with heat contact! I love real cotton potholder loops, don’t you? 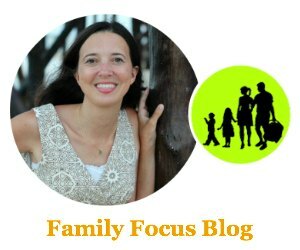 Visit heirloomwoodentoys.com and leave me a comment with a favorite toy! I was provided with the loom in the hopes that I would share my honest opinions. I received no monetary compensation and the opinions expressed are my own.